Mulberry Hill is a traditional, two-bedroom log cabin located in the heart of the Great Smoky Mountains. This two-story prairie-style home features a covered veranda at the front entrance that looks out into the trees and is furnished with old-fashioned wooden rockers. To the back of the house, an open-air patio is equipped with picnic tables and a grill. The interior of the cabin is paneled in warm, natural wood and lit by electric fixtures as wells as skylights. The front door opens into a large, comfortable living area with a wood-burning stove in the hearth. A large flat-screen TV and plush sofas make this a cozy space for the group to relax and socialize. The dining table is set for six and the kitchen is fully equipped with cookware and modern appliances. Guests at Mulberry Hill have full access to in-unit laundry facilities and high-speed wireless internet. All of the rooms are stocked with linens and towels. Sleeping arrangements: Mulberry Hill offers two private bedrooms. The first bedroom on the entry level is furnished with a queen-sized bed and has its own television and a two-person whirlpool tub. The second bedroom is located on the upper floor is also furnished with a queen-sized bed with a television and a full bath. A full-sized sleeper sofa is located in the living room. One of Mulberry Hill’s best features is a screened-in porch located off the first-floor dining room, which creates the perfect bug-free and gently lit environment to enjoy the mild evening air in the Smoky Mountains. The screen porch also functions as an indoor/outdoor recreation room with an air hockey table. Just outside the screen, a six-person hot tub and a fire pit are situated to appreciate of the view and sounds of nature. Mulberry Hill is ideally located to take advantage of attractions and entertainments in both Pigeon Forge and Gatlinburg. 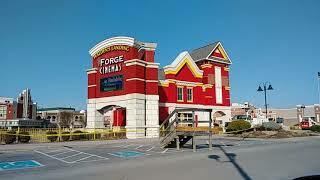 Pigeon Forge is home to more than 70 unique attractions, including Dollywood, mini golf, go-cart tracks, zorbing, whitewater rafting, numerous theaters and dinner shows, and of course tons of shopping, local restaurants, sporting venues and spas. In Gatlinburg, visitors can check off a number of famous must-sees from their bucket list, such as climbing the space needle, taking a zip-line aerial tour of the mountains, getting an adrenaline rush on a mountain coaster or visiting the Great Smoky Mountains National Park. Nightly rates from $130 to $150 plus taxes and fees.